Thunder All-Time team with a bunch of Sonics players???? It’s the last game of the calendar year and it finally feels like the Oklahoma City Thunder are starting to shed some of the bad luck that has hounded them these last few months. Everyone is healthy as Kevin Durant returns from a “mild” sprained ankle that kept him out for 6 games. When healthy, the Thunder are one of the best teams in the league, boasting a top 5 rated defense and a starting lineup that is pumping out some pluses on the offensive/defensive rating. It’s the staying healthy part of the equation that has been difficult. Hopefully, with the change in the year, maybe that part of the year will be behind us. This is the 2nd of 4 meetings between these two teams. 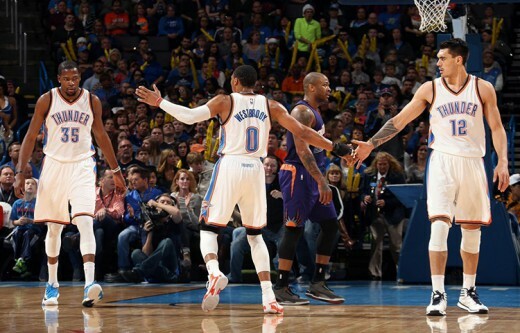 The Thunder completely dominated the Suns 112-88 in their first meeting. Of note, the Suns were without Goran Dragic in that game. The Suns are the current 8th seed in the Western Conference and sit 2.5 games ahead of the 10th-seeded Thunder. 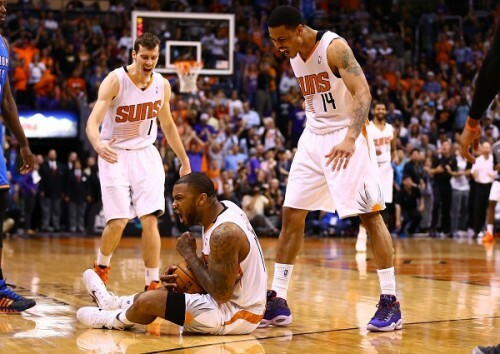 The Suns currently have an 18-15 record, and have been the model of consistent inconsistency. Their last 30 games have gone as follows: W1, L2, W2, L2, W4, L1, W1, L2, W2, L6, W6, L1. Lately though, they seem to have found a formula that works. The 3 guard line-up of Eric Bledsoe, Goran Dragic, and Isaiah Thomas has been decimating opponents to close out games. To begin games, the Suns switched out Mason Plumlee for Alex Len, and the move has paid dividends not only in the development of Len, but in boosting the bench with Plumlee, who is more suited as an energy guy off the bench. Markieff Morris and PJ Tucker provide defense and perimeter shooting for the starting line-up. Off the bench, the aforementioned Thomas and Plumlee, along with Gerald Green and Marcus Morris, keep the pressure on defenses and can heat up at any time in the game. 1. Small Line-up – Much like the Dallas Mavericks without Tyson Chandler, the Phoenix Suns will likely try to force a mismatch with their small ball line-up of Dragic, Bledsoe, Thomas, and two bigs (usually Morris and Len). And if they really want to get fancy, they may throw Green or Tucker out there for an extremely small line-up. The Thunder have the appropriate counters defensively (Westbrook, Reggie Jackson, Roberson, and even Ish Smith, if necessary), but some of those defensive counters are offensive liabilities for the Thunder. If it becomes a back and forth affair, the Thunder could be in trouble. 2. 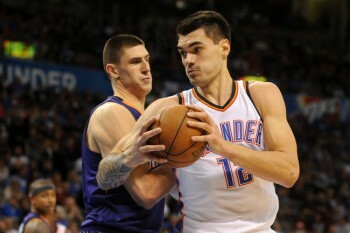 Alex Len vs. Steven Adams – Finally! We get to see the match-up from the 2013 NBA Draft that everyone has been waiting for. I may be exaggerating a bit, but with how these two have been developing this season, it is not outside the realm of possibility that this may be a premier center match-up in a season or two. 3. Kevin Durant – Welcome back Kevin. The last time we saw him in action, he was lighting the Golden State Warriors up for 30 points in 18 minutes in one half. Don’t get hurt anymore. Two weeks ago, it appeared that the Thunder would battle the San Antonio Spurs for Western Conference supremacy at best or stroll into the 2 seed at worst. Now, with losses in 3 of their last 4 games, the Thunder find themselves in an all-out sprint with the Los Angeles Clippers for the number 2 seed in the conference. The Clippers are just a game back in the standings by virtue of having played two more games (and consequently, having two more losses) than the Thunder. The Thunder have a bad habit of battling complacency in games that aren’t of much import to them, and then turning it on in games they deem important (Miami, San Antonio, Clippers, Portland). These last 6 games will be a great test to see if the team is mentally “there” heading into the playoffs. This will be the fourth and final meeting of the year between the Kings and Thunder. The Thunder have won each the 3 previous meetings this season by an average of 10 points, but only beat the Kings by 2 when they played in Sacramento early in the season. The Kings currently sit at 27-50, and are looking towards next season. In hand, they already have 2 important pieces as the team moves forward. 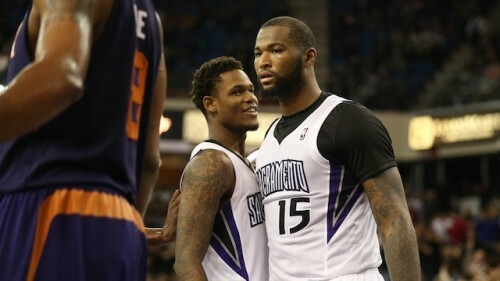 Ben McLemore is still finding his way in the NBA in this, his rookie season. DeMarcus Cousins, though, is showing everyone what his combination of skill and athleticism, along with finally showing signs of maturity, can lead to. And what it’s led to is a player that leads his team in scoring (22.3), rebounding (11.6), steals (1.5), and blocks (1.3). Unfortunately, the rest of the team is not very good. Rudy Gay gives you about 20 points of game, but is inefficient and gives you little else in the form of defense or playmaking. Isaiah Thomas does a good job of attacking the teeth of the defense, but is probably out for the rest of the season with a quad injury. 1. Trap Game Potential – With the Clippers game on tap for tomorrow, this game has trap game written all over it. I’m pretty sure the Thunder know what’s at stake, and what they have to do to maintain their seeding. 2. DeMarcus Cousins – With Isaiah Thomas out, this is the only player the Thunder really have to fear on the Kings. Steven Adams did a good job defending Cousins the last time they played, but will have to stay away from the fouls. 3. 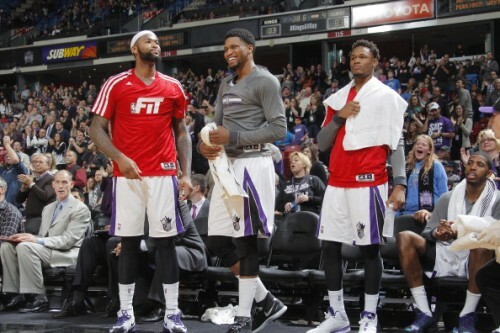 Rebounding – Cousins, Evans, and Jason Thompson all have a knack for getting to rebounds. If there is one way the Kings can hang around in this game, its by grabbing offensive rebounds and extending possessions. It’s games like these next two that make people complain about the length of the NBA schedule. A team that has already clinched a playoff spot versus two teams that are already playing for next season. Don’t get me wrong, though. This has nothing to do with the effort of the players. They are still giving their all (or giving enough to fake it). These types of games don’t offer much in the emotional investment department, unless you take into account caring about playoff seeding. 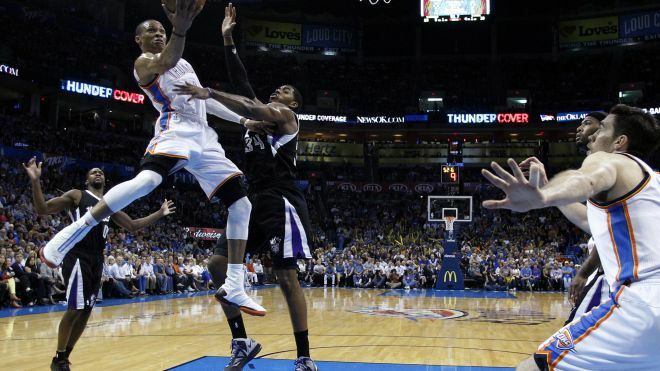 This is the third meeting of the year between the Thunder and the Sacramento Kings. The Thunder lead the season series 2-0. 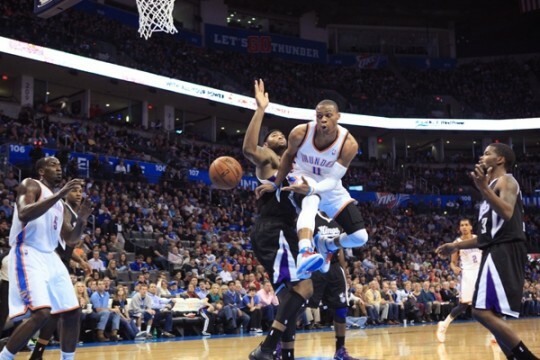 The first game was a back and forth affair that the Thunder won 97-95 in Sacramento. 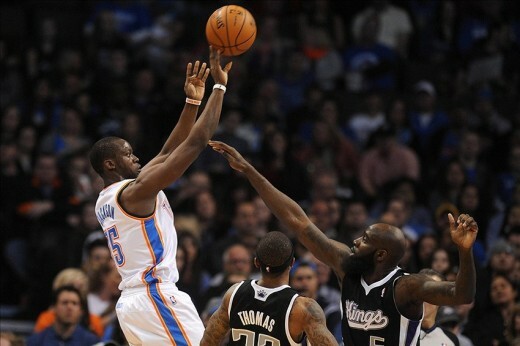 In the 2nd meeting, the Thunder took control of the game in the middle two quarters and cruised to a 108-93 victory. The Kings currently sit at 25-46. They are in the middle of a weird rebuild. They have some pieces to build off of (DeMarcus Cousins and Ben McLemore), but most everyone else on the team is in flux. To combat the youth of some of the key players on the team, the front office made some moves to obtain some veteran presence in Rudy Gay, Jason Terry, and Reggie Evans. The Kings are middle of the pack offensively (101.3 ppg, 13th in the NBA), but terrible defensively (103.6 ppg, 26th in the NBA). The team is a collective of isolation players as evidenced by their team assist totals (19 per game, last in the NBA). Isaiah Thomas does a good job as an attacking point guard, but acts more like an extremely undersized shooting guard at times. DeMarcus Cousins is finally starting to show some of the potential that tantalized many teams when he came out of Kentucky 4 seasons ago. He has transformed himself into a 20/10 guy. Rudy Gay is Rudy Gay: inefficient volume scorer who offers little else. The bench is a lot like the team itself: a weird mix of veterans and young players that doesn’t quite fit. 1. Tempering the Hot Hand – While its true that the Kings are inconsistent, their scorers are streaky and can heat up pretty quickly. 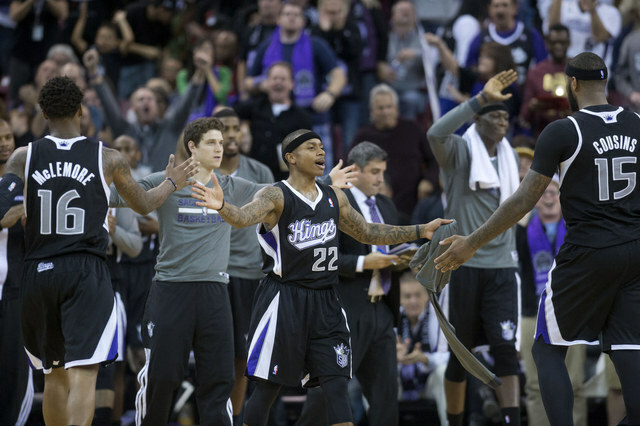 Rudy Gay, Isaiah Thomas, and DeMarcus Cousins all have the ability to light a defense up for 20 or more points. And we all know the Thunder are the team to play if you want to score a new career high. 2. 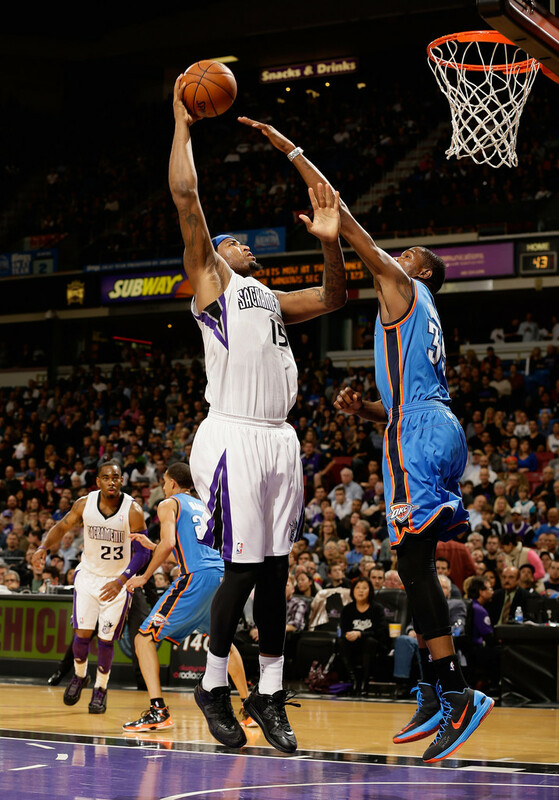 Rebounding – With Reggie Evans and DeMarcus Cousins up front, one of the things this team does well is rebound. Giving a bad team more opportunities to score is never a recipe for success. Steven Adams, Serge Ibaka, and Nick Collison have to make it a point to box out and keep the Kings off the glass. 3. Russ post-ups – Whether its Thomas or Ray McCallum, this should be a game where the Russell Westbrook post-up comes into play. Westbrook is too tall (Thomas) and/or too strong (McCallum) for either of these players to handle. After 2 weeks of great home cooking (6-0 homestand! ), the Oklahoma City Thunder head west for a 2 game back to back set, before ending up in New Orleans for the 3rd game of the road trip. The first leg of the road trip takes the Thunder to Sacramento for their first of four meeting with the Kings this season. The Thunder come into the game riding a 7-game win streak after having lost 2 games in a row on their last road trip. The Thunder swept the season series against the Kings last season, 3-0, with an average margin of victory just below 10. After nearly losing the franchise to Seattle in the off-season, the Arco faithful (Sleep Train, really?) may be clamoring and cow-belling from this type of game. Today’s game day preview is brought to you by the letter W and the number 1. The magic number for the Oklahoma City Thunder to clinch the number 1 spot in the Western Conference is one. A Thunder win or a San Antonio Spurs loss will get us there. Considering the Thunder game is on before the Spurs game, we’ll hopefully know if the Thunder have clinched so that Spurs coach Gregg Popovich can make a decision whether to rest his starters or not. It would be the first No. 1 seed in the Thunder’s history and would put a rousing exclamation point on a season that began in such disarray with the James Harden trade. It would be an assertion of the hard work and dedication that the Thunder place on “getting better.” When a top player on a team leaves, others have to step up. And that’s what all the Thunder players have done. From Kevin Durant on down to Hasheem Thabeet, every player in the rotation has improved in some facet of his game. But let’s not count our chickens before they hatch just yet. The Thunder still have a game to play and must win it to ensure that the No.1 seed doesn’t come down to the final game of the season. The Sacramento Kings come into the game having lost 6 of their last 7 games. It’s been a bumpy ride for the Kings and their fans this entire season, as they have had to handle immature players, internal strife, and insecurities about whether the team will be playing in Sacramento or Seattle next season. Luckily for the Kings, the 16th technical that DeMarcus Cousins received in their last game was rescinded, and he’ll be able to play in the game tonight. The Thunder have won both games against the Kings this season, and look to sweep their Pacific division rivals in Oklahoma City. 1. Playoff Spoilers – There’s nothing better for a team out of the playoff race than to ruin a playoff team’s night. The Kings know the Thunder are playing for something. This will be akin to a playoff game for Sacramento. The Thunder need not give this young team any inklings of hope to turn this into a game. 2. Turnovers – Young teams feast on turnovers. It’s the life blood that keeps them in games. The Kings have the ability to turn a live ball turnover on one side of the court into a fast break score on the other in the blink of an eye. Protecting the ball will be key to limiting the Kings’ offensive opportunities. 3. Hasheem – He did a good job on JJ Hickson in the Portland game, but Cousins is a different type of player. He has a vast skill set with the ability to hit 20 footers consistently or post up in the paint. He should be consistently averaging 20 points and 10 rebounds, but is derailed most of the time by his immaturity and frustration. Hasheem will have his hands full tonight and I wouldn’t be surprised to see Nick Collison get his fair share of minutes.